1. Honky Cat – The first song tackled in the making of this project – we wanted to give it a “swampy blues” feel, featuring a dobro guitar that will take you to the bayou. 2. Rocket Man – In keeping with the theme of this song, we created the “outer space” feel by utilizing harmonics and effects with a few different guitars. Some folks have said this version has a “Neil Young” feel to it as well. 3. Daniel – As depicted in the lyrics of this song, Daniel has a love for Spain so we decided to give it that type of feel, highlighted by a nylon-string classical guitar. 4. Your Song – Why mess with a classic? Certainly one of Elton’s biggest hits, we wanted to keep this simple and somewhat close to the original, not to mess with success. 5. Club At The End Of The Street – A Motown-turned-rock version, we had a great time making this one. As in the Elton version, though, we just had to use a sax lead as well – too powerful to avert! 6. Sorry Seems To Be The Hardest Word – Featuring world renowned female singer Mae McKenna, we created a “dialogue” love song between a woman and a man trying to make it work. 7. Crocodile Rock”appella” – We tweaked another one of Elton’s classics into a “sock-hop” feel – we hope you enjoy this one! 8. The One – One of Elton’s more current hits, we feature a violin in this beautiful love song, trying to keep this version somewhat close to the original. 9. Country Comfort – Join us on the front porch, just a pickin’ and a grinnin’ with us! 10. Blessed – Featuring two nylon string classical guitars, we put a bossa nova feel to this song as another twist to one of Elton’s beautiful love songs. 11. Tiny Dancer - We added a little bit of a “Steve Miller” feel to this one . . .
12. Sad Songs – Nothing sad about this one! 13. I Guess That’s Why They Call It The Blues – A true “delta Blues” version of one of Elton’s greatest hits. 14. I’m Still Standing – Just when you thought we had covered all the possible genres out there, we threw in a little reggae beat to get you on the beach with that umbrella drink! 15. Friends – A not-too-well-known song of Elton’s from his earlier years, this was a soundtrack made for a movie called “Friends” with a great message behind it. 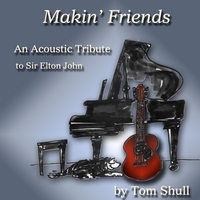 As our title track says, “Makin’ Friends” is what this project was all about from the beginning. I hope you enjoy – thanks for listening!